For some gardeners, growing blueberries is a test of their skills. 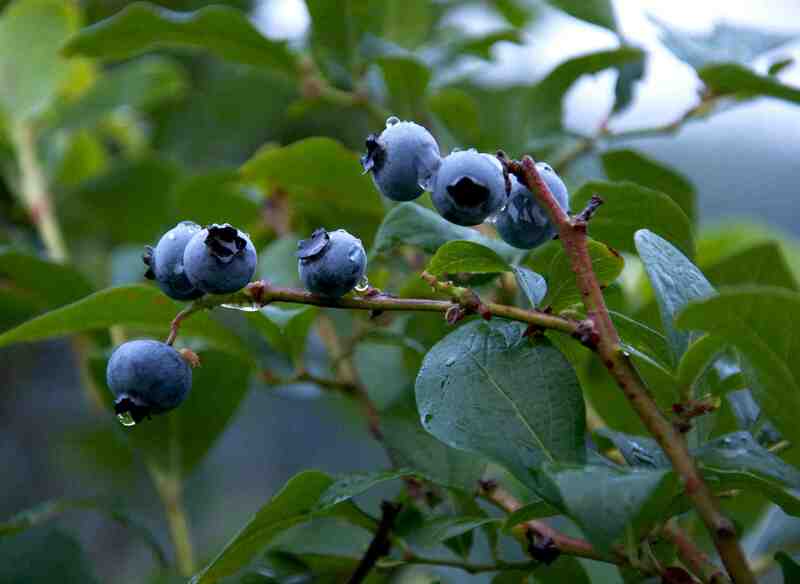 Conditions must be just right for blueberry plants to survive and produce fruit. And although Wisconsin's climate is perfect, the soil - especially in the southern part of the state - isn't what blueberries like, said Vijai Pandian, a horticulture educator with University of Wisconsin-Extension Brown County. "Blueberries are very picky about their soil pH. They like an acid soil, ranging from 4.5 to 5.5 pH," he said. "Most soil in Wisconsin is 7, slightly alkaline, that makes it very challenging to grow blueberries." Pandian suggests having the soil's pH tested to find out if it can grow blueberries. Volunteers in the master gardener program in Brown County have been experimenting for a few years with ways to grow blueberries in areas where the soil isn't at the right pH. They found a soilless environment, in a container or in a trench system, works best, he explained. "To grow them in a soilless medium is easy," Pandian said. "Instead of using original soil, you use a mix of [sphagnum] peat [moss], perlite and pine bark." A 1-to-1-to-1 ratio is best, without any original soil, compost or leafy material - all of which may alter the pH, he said. Adding some sulfur each spring will help preserve the ideal pH. Fertilizer is also important. Beginning in mid-May and every two or three weeks until mid-July, fertilize with Miracid - or fish emulsion or blood meal, if growing organic, Pandian explained. He added that gardeners should dilute according to package directions and drench the roots at the soil, not on the leaves. Where the plants are placed is important, too. "Sunlight is a critical factor that will trigger blossoms," Pandian said. "If you want a successful blueberry crop, you're going to need about six or eight hours of sun [each day]." To grow blueberries in a trench system, he recommends digging a bed of about 4-feet-by-6-feet. And because blueberries are shallow-rooted plants, the bed only needs to be about 10 inches deep. A wooden frame, around the outside of the bed, will help keep surrounding soil from seeping into the trench. The trench is then lined with landscape fabric and filled with the soilless medium. To minimize fungal disease, plants should be placed 2 to 3 feet apart. To grow blueberries in a container, Pandian suggests a size that is 5 gallons or larger and bury the containers in the ground. This will help them retain moisture in the summer and stop them from freezing in the winter, he added. "You need to have good drainage holes, blueberries tend not to like wet feet," Pandian said. "Blueberries are very susceptible to water stress. Eighty to 90 percent of their roots are on the top 6 inches of the media, so they need a frequent light watering." He recommends watering every other day and directing the water to the root system, not the leaves to help avoid water and heat stress, which can turn leaves a rusty color. To help keep in moisture, sawdust or pine needles can be used as a mulch around the plants. Blueberry plants should start producing berries in their second year and peak production will start after three or four years, Pandian said. His recommendations for good growing varieties include Patriot, Blue Crop, North Blue and St. Cloud. To protect plants and their berries from wildlife, Pandian recommends a fence and the use of bird netting. Chipmunks are especially adept at getting under the netting, so nailing the netting to the wooden frame or into the ground will help preserve the blueberry crop. Tips For Growing Blueberries In Wisconsin was originally published on WisContext, which produced the article in a partnership between Wisconsin Public Radio, Wisconsin Public Television and Cooperative Extension.